Thalassemia is a genetic blood disorder in which the bone marrow cannot form sufficient red cells and red cell survival is also reduced. Thalassemia is an inherited blood disorder. 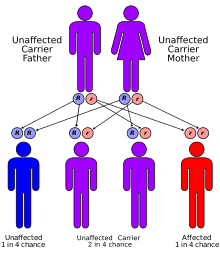 "Inherited" means they're passed on from parents to children through genes.In thalassemia, the genetic defect results in reduced rate of synthesis of one of the globin chains that make up hemoglobin. Hemoglobin is an iron-rich protein in red blood cells. It carries oxygen to all parts of the body. It also carries carbon dioxide (a waste gas) from the body to the lungs, where it's exhaled. Reduced synthesis of one of the globin chains can cause the formation of abnormal hemoglobin molecules, thus causing anemia, the characteristic presenting symptom of the thalassemias.Thalassemias affect both males and females. They occur most often among people of Italian, Greek, Middle Eastern, Asian, and African descent. Severe forms usually are diagnosed in early childhood and are lifelong conditions. Thalassemia minor: Thalassemia minor occurs if you receive the defective gene from only one parent.Persons with the minor form of alpha and beta thalassemia have small red blood cells (which are identified by looking at their red blood cells under a microscope), but no symptoms. A physical exam may reveal a swollen (enlarged) spleen. When A blood sample will be taken and sent to a laboratory for examination, red blood cells will appear small and abnormally shaped when looked at under a microscope and a complete blood count (CBC) reveals anemia.A test called hemoglobin electrophoresis shows the presence of an abnormal form of hemoglobin. Untreated, thalassemia major leads to heart failure and liver problems, and makes a person more likely to develop infections. Blood transfusions can help control some symptoms, but may result in too much iron which can damage the heart, liver, and endocrine system. Treatments for thalassemias have improved greatly in the past few years. People who have moderate and severe thalassemias are now living longer and have better quality of life than before. Patients with thalassemia minor usually do not require any specific treatment. Treatment for patients with thalassemia major includes chronic blood transfusion therapy, iron chelation, splenectomy, and allogeneic hematopoietic transplantation. These transfusions are necessary to provide the patient with a temporary supply of healthy red blood cells with normal hemoglobin capable of carrying the oxygen that the patient's body needs.While thalassemia patients were given infrequent transfusions in the past, clinical research led to a more frequent program of regular blood cell transfusions that has greatly improved the patients' quality of life. Today, most patients with a major form of thalassemia receive red blood cell transfusions every two to three weeks, amounting to as much as 52 pints of blood a year.People recieving such transfusions should avoid taking any iron supplements. Doing so can cause a high amount of iron to build up in the body, which can be harmful.To help remove excess iron, for patients who receive significant numbers of blood transfusions, they need to undergo "iron chelation therapy," in which a drug is introduce dinto the body which binds with excess iron and removes it through the urine or stool. Bone marrow transplant may help treat the disease in some patients, especially children.